Lutron Programmer - Technical Comfort, Inc. When you are building a luxury home with Lutron lighting and shading systems, one of the most important parts of that project is to find the right Lutron programmer. Because of his industry-leading Lutron programming skills, Rick Wlodyga has led our company, Technical Comfort, to become a two-time winner of Lutron Excellence Awards in 2008 and 2009 and has been a Lutron diamond dealer since 2010. We’ve won these awards because our number one goal is customer satisfaction and providing exceptional service and responsiveness to each and every client. We get to know our clients and how they live in their homes, which allows us to program and customize each system to the particular needs and desires of each individual client. We are so well known for our ability to handle challenging and complex systems that Lutron relies on us to solve the problems of both contractors and homeowners who have been disappointed with other Lutron Programmers. Whether you already own a home automation system and you’d like to upgrade to the latest Lutron systems, or you want to install a brand new system in your home, we’ve got the Lutron System Programming, design, and Installation experience you are looking for. 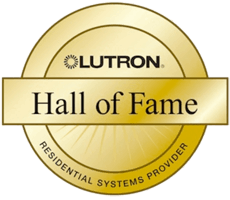 In fact, Technical Comfort has been a top Orange County Lutron programmer and contractor since 2004. We work with General Contractors, A/V Contractors, Electrical Contractors, and Interior Designers, but we also work directly with owners of beautiful homes. Regardless of who we work with, we focus on taking care of the homeowner and making him or her happy. We specialize in the sales, service, design, programming and installation of Lutron lighting and shade control systems, including Homeworks QS, RadioRA 2 and RA2 Select systems. Set the scene for a backyard party? Light your home for an intimate dinner? Set the shades in your bedroom to automatically close at sunset to ensure night time privacy? Enjoy your home theater environment to its fullest? Keep the afternoon sun from heating up your home and/or damaging your furnishings? Be able to press one button before you go to bed at night and know that all of your lights and shades are set exactly the way you want them? Increase the energy efficiency of your home? All of this, and more, is controlled by the thoughtful design and programming of your Lutron system...and why we put so much effort into learning more about you and your lifestyle. At Technical Comfort, we have the experience, expertise and commitment to customer satisfaction to make your home automation dreams a reality. Technical Comfort excels at working with contractors. Our goal is to make you look good. We accomplish that by making sure your client is satisfied throughout every step of the process. General contractors love us because we are proactive in the planning process which helps avoid the pitfalls of coordinating multiple subcontractors. We take responsibility for making sure that everything that interacts with and is controlled by the Lutron system works as the homeowner wants it to. Electrical contractors love us because we are licensed C-10 electricians, so we speak their language and understand their challenges. We help them plan ahead when it comes to the electrical requirements of the Lutron system and its programming, including expert integration of LED lighting. A/V contractors love us because we allow them to focus on their area of expertise while still providing a complete control solution. And interior designers love us because we care as much about a beautiful home as they do. If you’re a contractor and want to do your best work for your client, let Technical Comfort be the Lutron Dealer, Lutron Installer and Lutron Programmer for you and your clients. At Technical Comfort, we are always busy and in demand, so please call us early so we can make time to properly plan and schedule your Lutron system programming and installation project. Our office is conveniently located in Laguna Niguel, close to all of Orange County and surrounding areas.